Lost in Space Robot B-9 by artist David Venne. 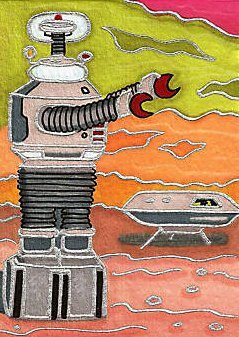 "Danger Will Robinson" Hand drawn with fine art markers (not a print) ACEO - 3.5 x 2.5 inches. ACEO's (Art Card Editions and Originals) are 2.5 in X 3.5 in collectable paintings the size of traditional trading cards. Miniature art is one of the hottest new trends in art collecting. It has become an increasingly popular way to collect a wide range of original art from artists around the world at very reasonable prices. Made with a high quality acid free pigment inks on Canson 185 lb acrylic paper.